Two-thirds of people would rather consume content that is well-designed over that which is plain or boring. This statistic applies to both web and print graphic design. But there are many key differences between print and web design principles. What works best for one can be detrimental to the other. Creating effective content will help you reach a wider desired audience, but how exactly do you optimize your graphic design for the required format? Keep reading for the seven differences between print and web design that we think matter most. We’re going to focus on the differences between web and print design principles, but there are also many similarities to keep in mind. Both formats rely on color theory, typography, high-quality photographs or images, and effective copywriting to create attractive content. These are the basic principles of any good design, regardless of how it will be published. But it is the way that these techniques are used that can differ. There are some obvious differences between print and web design practices. Print design is displayed on paper, fabric, wood, or another permanent medium. Web design is displayed on a digital screen of some kind. But there are also some less obvious differences in print vs web design. Using the right types of images in the right ways – dependent on the medium you are designing for – can elevate your design work from good to great. Different types of graphic design require different color formats. The main formats are CMYK, RGB, and HEX. The color format used for printing is CMYK. CMYK stands for cyan, magenta, yellow, and k (representing black). These are the base ink colors that combine to create each color in your photo or design. You can see this system in the cartridges of your typical at-home inkjet printer. The RGB and HEX color formats are used for digital and web designs. RGB stands for red, green, and blue and is the most common color mode in programs like Photoshop and InDesign. Graphics created in these programs can be left in RGB for the web, or converted to CMYK for printing. HEX is short for hexadecimal and is the color format used by web browsers. Developers use this format for the background color of websites, fonts, and anywhere they need to program a color with HTML. There are two different types of texture in design: that which is felt and that which is seen. Print media has the benefit of using felt and seen texture. Achieving a unique texture is as simple as the printer’s choice of fiber. Embossing techniques add tactile texture to printed paper or fabric like velvet. These techniques are often seen on product labels, book covers, and business cards. These textures can be imitated with photos, but the tactile experience isn’t there. In flat print, high-resolution photos can bring striking texture to a design. Detailed photos of landscapes, skin, feathers, and fur offer natural texture. In web graphic design, texture must often be simulated. But these techniques can be noteworthy all on their own. Overlays and 3-D images can introduce texture to digital images. Photo effects, such as the illusion of dust particles, add depth to flat print or web designs. Dpi stands for dots per inch or the number of dots of ink within a square inch of a printed image. The higher the dpi of an image, the clearer and better quality the final print will be. Different printing studios will have different dpi requirements. For example, New Era Print Solutions recommends that print designs are at least 300dpi, but some studios will accept files as low as 150dpi. Even if a studio says they will accept lower dpi images, you should be cautious. Lower dpi images can be blurry and poor quality, especially when printed in larger sizes. For digital graphics, the best web resolution is 72ppi. This means that there are 72 pixels per inch of an image. While this unit of measurement is similar to dpi, it is not quite the same. When it comes to font choice, readability is the most important factor. Certain fonts are better suited to print designs than web, and vice-versa. The main difference is whether a font is serif or sans-serif. Serifs are the little flairs seen on some fonts’ letters – Times New Roman is one of the most well-known examples. Sans-serif fonts don’t have these extra flairs on their letters. Serif fonts are best for use in print media. The serifs make it easier for our brains to identify letters and words, especially when reading a full page of a book, newspaper, or magazine. When creating blocks of text for a website or other digital media, sans-serif fonts are best. Serif fonts tend to blur together on screens, especially in smaller font sizes. There are also some differences in the font when it comes to licensing and use. When searching for a font for your design you may see two categories, desktop fonts, and web fonts. Desktop fonts are often downloadable and can be used in any number of digital or print graphics. Web fonts, as the name suggests, are used for websites. These fonts are optimized for the diverse range of browsers and devices that a website could be viewed on. Print design offers some unique opportunities. Physical media can interact with the different senses, such as perfume ads scented with their advertised product. Print designs are constricted to a permanent size and shape, whereas web designs are not. In print design, content must be prioritized by importance. Once something has been printed, there is no easy way to change or alter the layout. In web design, the audience can scroll and click on a changing environment. This allows them to focus in on the information that is most important to them. Web design can have changing elements, such as a rotating list of articles, that allow more information to fit into a small space. Videos and audio can also be used to expand and diversify a web design’s content. When creating content for print media, everything needs to be perfect. Changes to the design or content will usually require a reprint. This is expensive, time-consuming, and can be quite wasteful. Designing for the web is more convenient because you can make changes at almost any time. Because of this, web designs are often subject to small, minute edits as needed. Web designs tend to have longer lifespans than print design. You are able to edit the content as needed, and you can make small changes quickly and easily. Otherwise, you would need to justify these changes with an entire design overhaul. Lifespan is an obvious factor when it comes to typos or errors in the design, but can also be an issue for normal content maintenance. For instance, a change in business hours would require a business to completely reprint their brochures. This is a simple change for a website. In the modern era, web design has one indisputable advantage over print design: the degree of accessibility. With around 20% of U.S. citizens being disabled, accessibility features allow your content to reach a wider audience. This is often not possible in traditional print media. Web designers are able to optimize their designs for screen readers, include closed captions for videos, and provide alternative navigation controls for disabled viewers. New accessibility technology is constantly being developed. These revolutionary features will continue to grow in the coming years, so it’s smart to implement them in your designs whenever possible. 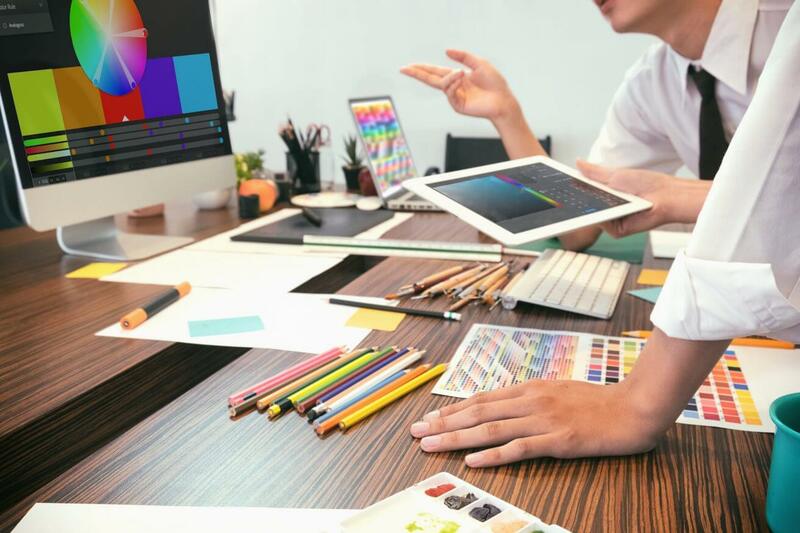 While print and web designs may seem very similar on the surface, paying attention to these seven differences can elevate your work to a whole new level. Knowing how to translate similar concepts between print and web can be a great skill for any graphic designer to learn. As we enter a primarily digital age, companies are looking for talented designers who can create cohesive content across both formats. Of course, print graphic design will never become entirely obsolete, but it is no longer the powerhouse it once was. Our free texture images and high-resolution photos are a great way to add dimension to print or web graphics. Let us know your favorite way to bring texture to your designs in the comments below!